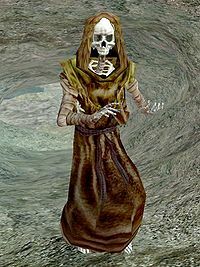 Description: A creature which once was a wizard attempting to gain immortality by capturing his soul in an object, turning him undead. 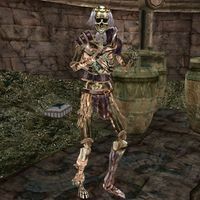 A lich can cast powerful magic and resists various attacks. Liches are rare, but extremely dangerous. Drops: Iron Shield, Bonemeal and Random Iron Weapon. * This effect (called Gedna's Barrier ability) does not provide any additional benefit beyond 100. Weakness to Magicka is useless in this case, but no more so than at 100, since the spell itself would be resisted by the Resist Magicka. 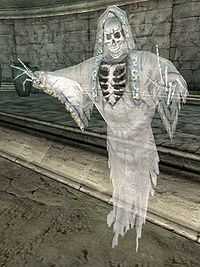 * Variner's Ghost is not hostile. Rather, he gives you a helpful tip during The Black Dart Gang quest. 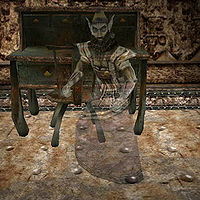 * Radac is not hostile, and is in fact required for The Blade of Nerevar quest. Killing him before completing this quest will make it impossible to finish the Main Quest.